By any other name they are still just as good. 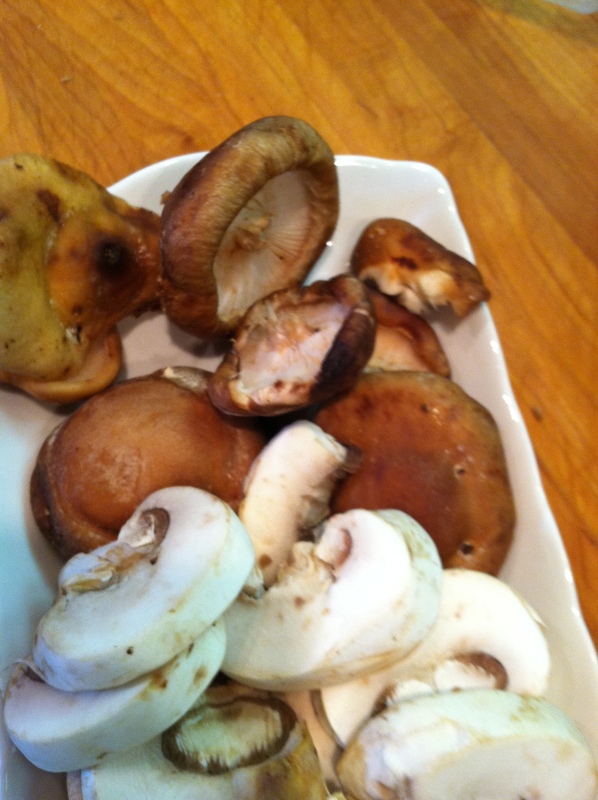 Let’s make Mushroom Risotto and if you have any left, you can hop over to Frugals site and make the Arancini. Think of them like little sponges. if you run them under water or (horrors!) soak them in a bowl of water to ‘clean’ them, you are water logging the poor little mushroom. The mushroom will release that water while you cook, you will not get a good color on them when cooking. Instead of saute, you will be braising them. Instead, wipe them with a clean towel, trim the tough part of the stem (shiitake – remove the entire stem, it is tough) your are ready to go. Portobello mushrooms can be ‘peeled’ to create a prettier mushroom. 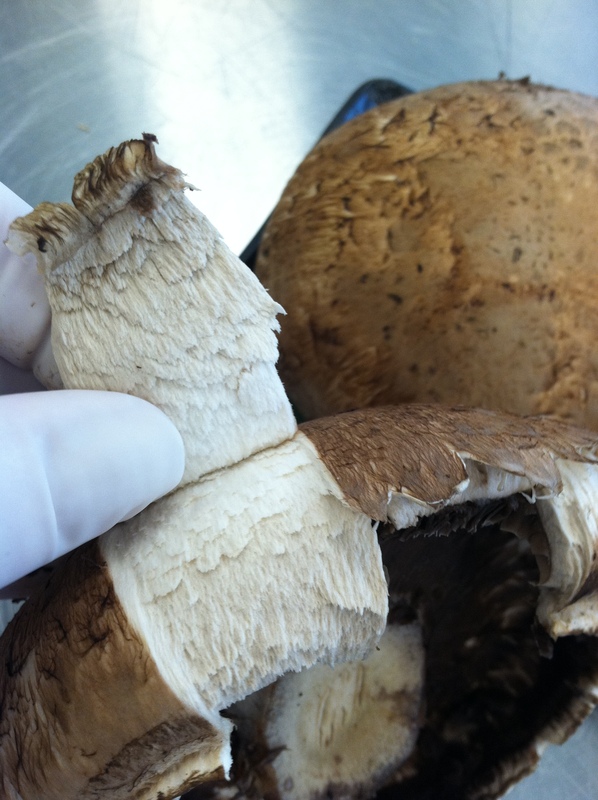 Use a spoon to scrape out the gills and then peel the lip of the mushroom to remove the top layer, peeling towards the top middle of the mushroom cap. Save the scraps for flavoring stocks for soup or sauces. 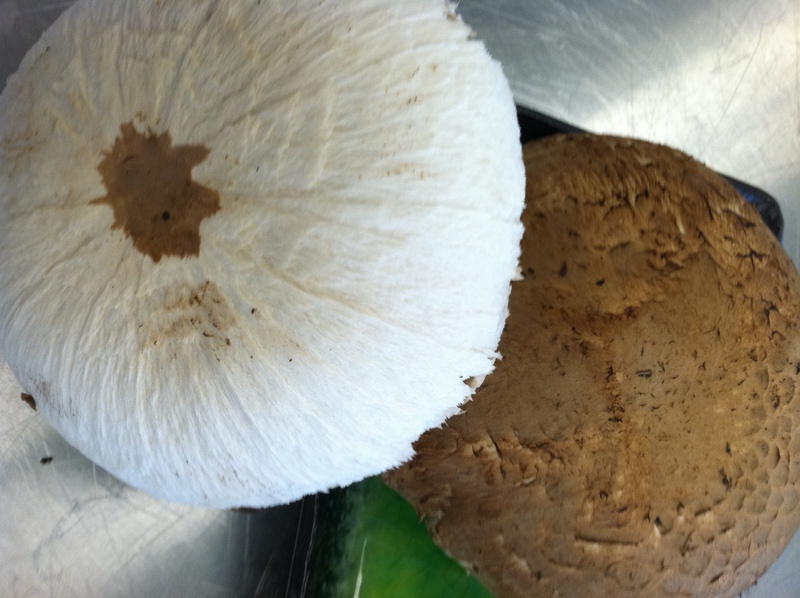 1 peeled Portobello and 1 not peeled ; see the difference? Save those scraps! Freeze them. 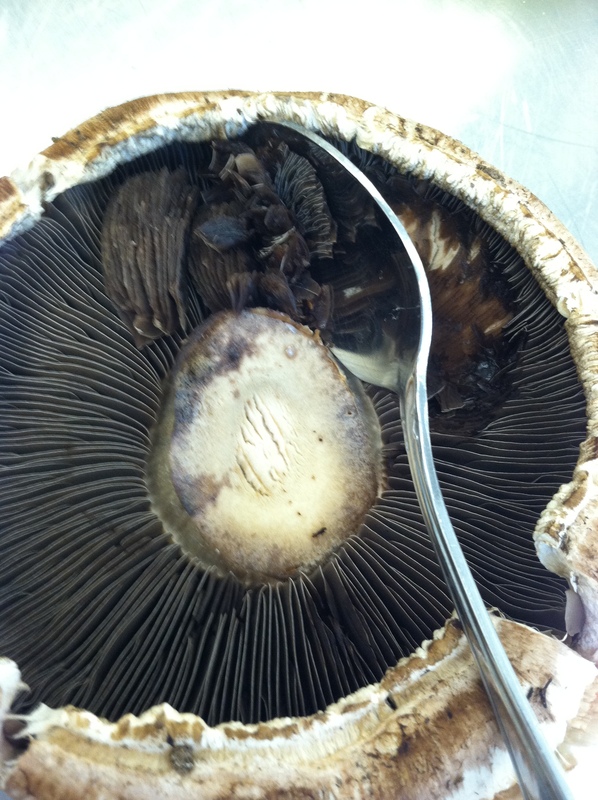 If you use Portobello mushrooms, be sure to clean the gills out from under the cap. They turn everything a dark, almost black color. If you use a stock that has salt in it, adjust your salt flavor at the end. Salt concentrates as liquids evaporate. 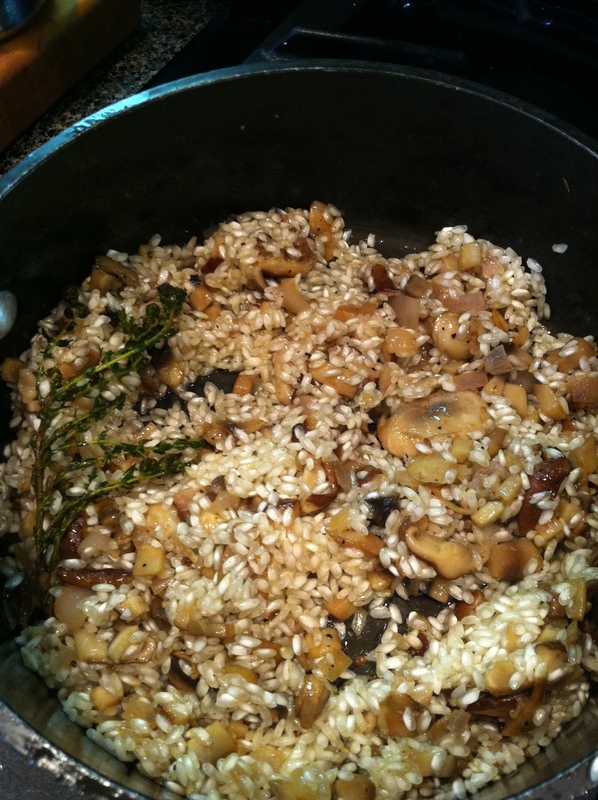 Cook the mushrooms first in the same pan you will cook the risotto. This allows the mushrooms to develop that deep flavor for which mushrooms are so famous. Heat the pan over high heat, add oil. 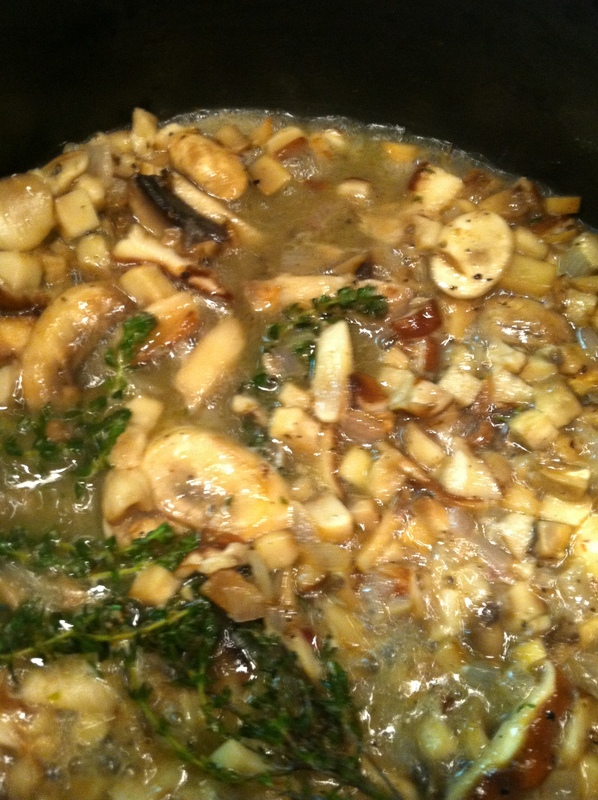 Add mushrooms sliced shallots, garlic saute until they begin to develop color and start to release their juices. Add white wine to deglaze and cook until the pan is nearly dry. 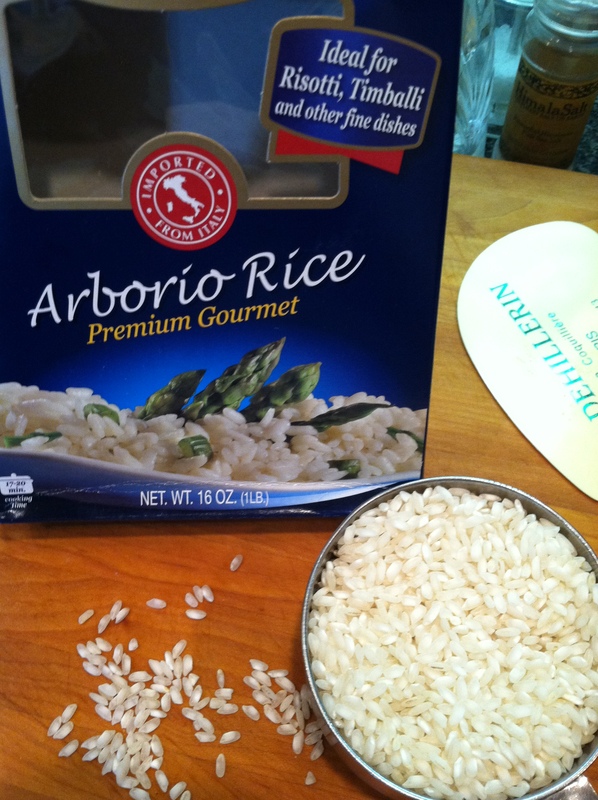 Now add the rice and continue with the risotto recipe below. 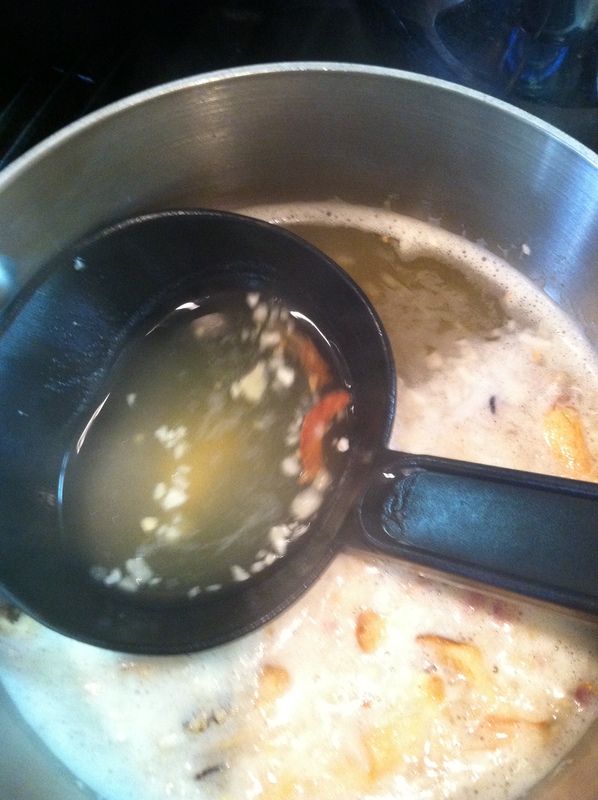 Heat the chicken stock in a pot and have it nearby with a ladle. 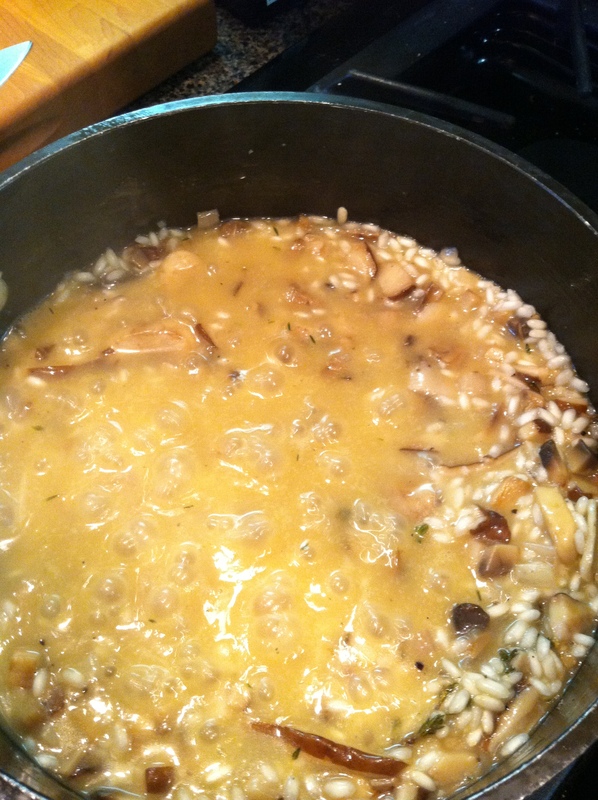 In the same pan you cooked the mushrooms above, add the rice. Saute for 2 minutes. Stir to coat the rice with the mushroom goodness in the pan. Ladle about 8 ounces of warm stock into the rice pan. Stir to combine and continue stirring until the stock has been absorbed. The last addition will be 1/2 cup white wine, stir until the wine has been absorbed. Stir in the Parmesan cheese and the butter. Saute the mushrooms, shallots, garlic, thyme and wine to develop flavor in the mushrooms before adding rice. Cook down to nearly dry again. I learned to make risotto the old-fashioned way; by stirring a lot. Stirring makes it creamy. There are some methods where you cook it much like you do plain rice. I don’t find the results as creamy as the stir-like-a-madman method. Besides, it gives your arms a decent work out. 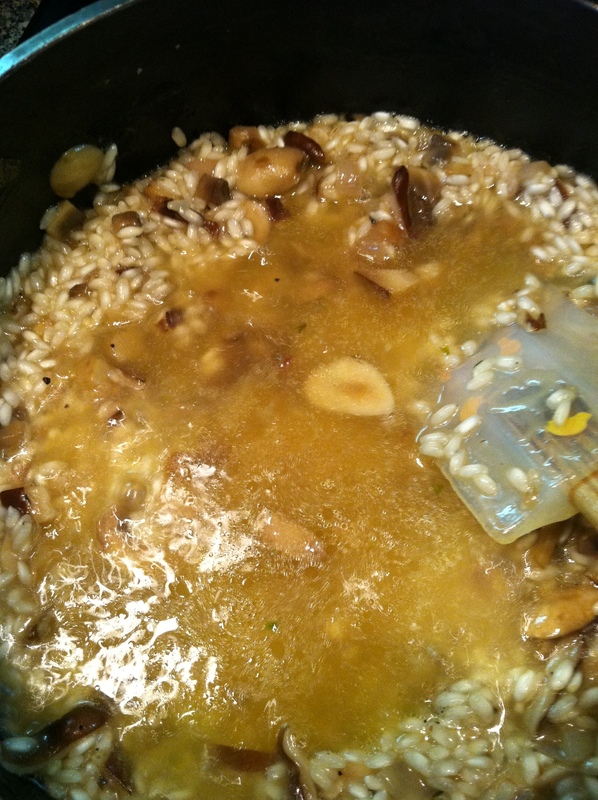 If you want to make risotto and hold it for serving later, take it only half way through the steps of adding stock. Cool it down. When you are ready to finish, heat more stock, add the rice and finish the cooking process. Serve immediately as risotto can get quite gluey as it cools down after it finishes cooking. I made enough to have some leftover for the Arancini but when I went to make them, there was no leftover risotto. So the myth continues, there is no such thing as leftover risotto. I haven’t seen much leftover wine either. Robert said to just make more risotto and make the Arancini immediately. I think he just wants more risotto. 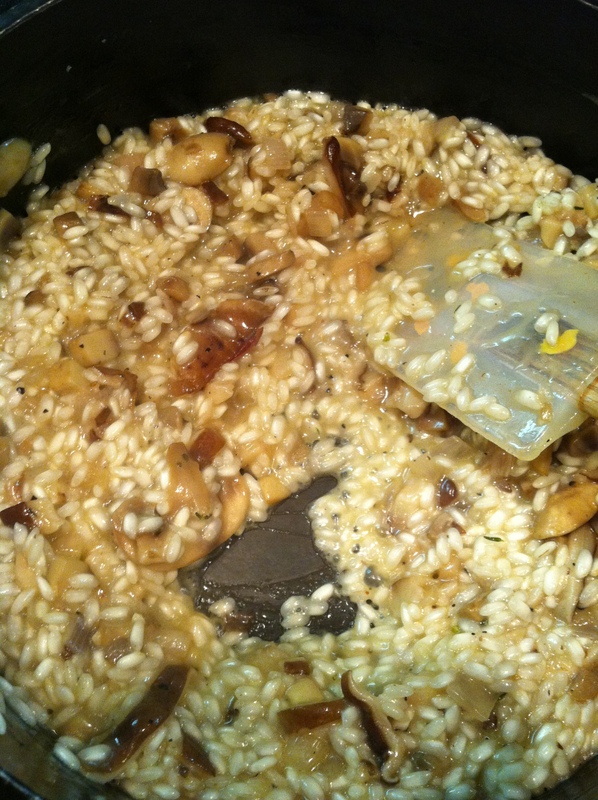 This entry was posted in basic skills, Recipes and tagged cook, Garlic, Mushroom, Parmigiano-Reggiano, Protobello mushrooms, Recipe, Risotto, Sautéing, Shallot, shiitake mushrooms, Stock (food). Bookmark the permalink. You’re making me hungry! 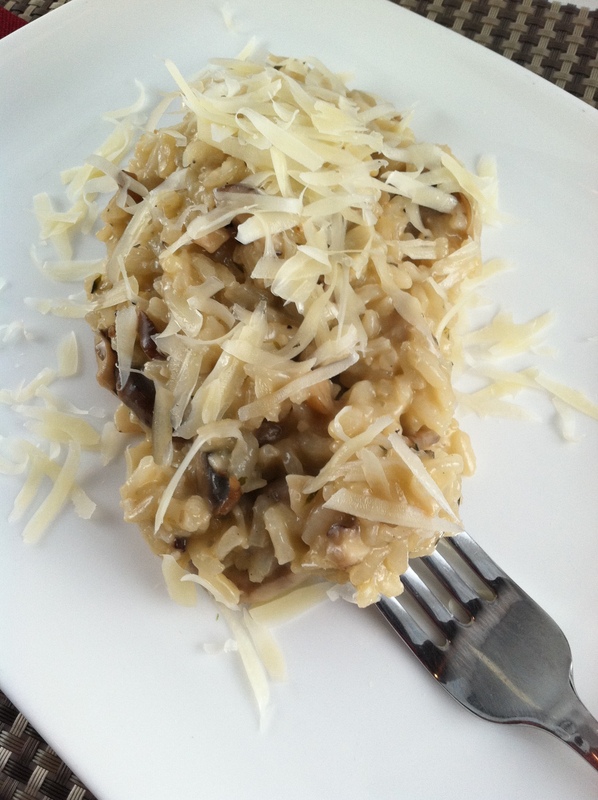 I LOVE risotto, especially with Reggiano Parmigiano cheese on top! The perfect comfort food. Your photos are so good I can smell the shrooms! Thanks Adria! I’m going to have to make more soon, Robert keeps asking for the arancini.